Oceanside will be a soggy place for the next two days - then will dry up dramatically like the rest of the state. (Portland, Oregon) - More weird weather for June is hitting northwest Oregon and southern Washington, according to the National Weather Service (NWS). The impact will be felt from the Oregon coast and Washington coast, into the coast range, through the valleys and into the Cascade Mountains of Washington and Oregon, and it could mean some snow for high elevations along with the possibility of thunder in some areas. Affected cities will include the areas of Portland, Salem, Eugene, Silverton, Government Camp, Cannon Beach, Manzanita, Tillamook, LincolnCity, Vancouver, Battle Ground, Stevenson, Long Beach, Oakridge, Willamette Pass, Cascade Locks, McMinnville, Bend, Sisters and more. The NWS said more unseasonably cool and wet weather is moving in after Tuesday, as this part of the northwest will transition back to cool, cloudy and wet on Wednesday and Thursday. It’s going to mean raining buckets in many places. By the middle of Wednesday the NWS predicts there could be up to a half inch of rain in the valleys, while an inch or an inch and a half could dump on higher terrain, such as the routes to the coast. This will shift to on and off showers later on Wednesday. A clap or two of thunder is not out of the question in the afternoon, as the air mass becomes further unstable. And the soggy fun won’t stop there. “Colder air will be moving into the Pacific Northwest through Thursday morning,” the NWS said. Temperatures will likely drop to what is ten degrees below normal for early June. This weather system will then cause snow levels to lower considerably – what the NWS called “unseasonably low elevations.” It’s not expected to impact travel in the Cascade Mountains, however. Campers, hikers and others engaging in outdoor recreation in the Cascades should be prepared for much cooler temperatures and conditions that are more like those of early spring. The NWS warns that recent snow in the higher elevations has increased the danger of avalanches on high elevations such as Mount Hood, Mount St. Helens and Mount Jefferson. The forecast for the Oregon coast generally calls for temperatures in the upper 50’s for the next few days. 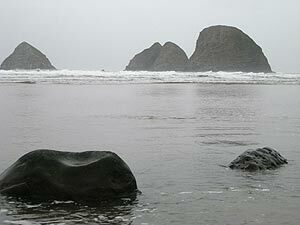 More detailed Oregon coast weather is at the Oregon coast weather page, and more detailed Oregon weather is here.